One of my dear friends recently published her March playlist and I just had to share it on Practically Imperfect. Laura was one of my very first friends at UCLA. She has the sweetest soul and, as you can obviously see, is a beautiful writer. 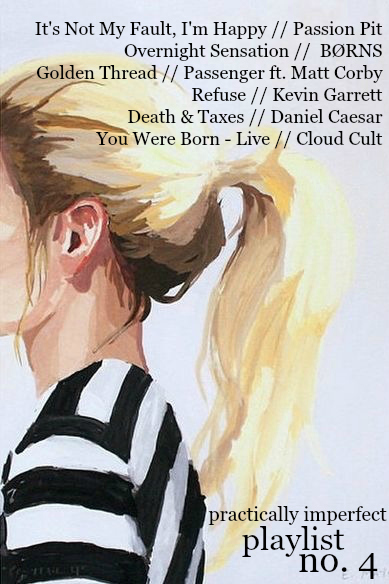 Her playlist takes you through a hypothetical day in March. I think her song choices perfectly embody what early spring is all about: hopeful days full of new beginnings and sweet tunes. This playlist is just six songs; a quick listen while you're getting ready in the morning or walking to class. Reading this piece and listening to these songs absolutely lifted my sprits and left me ready to tackle the day head on. I hope it leaves you feeling a similar way! By the time March rolls its slender shoulders back and faces front to stare the future in its face, you've settled into the rhythm of the new year. You have a pattern and a pace; you're more patient and better prepared. Most days, you have time to digest your moments as they unfold; some days, you even have time to make a playlist. (10:45 am) It’s Not My Fault, I’m Happy // Passion Pit It is bright and crisp outside. In the sound of your shoes scuttling on the pavement, you hear the cackle of the coffee machine as it sputtered and grooved earlier this morning. You are convinced that your hands smell like the milk and brown sugar you clumsily stirred into your cup, but tell yourself the smell isn’t strong enough for anybody around you to really notice. You go out of your way to make eye contact with strangers. You plot to fall in love with one of them someday. (2:23 pm) Overnight Sensation // BØRNS Inside the classroom, your brain cells are gloomy and wilted and gray. But outside, the world is peaceful and warm and hums in a major key. You imagine God watching the earth like a six year old watches an anthill: eating a grape popsicle, smiling stupendously with his eyes glued to the spectacle. (6:01 pm) Golden Thread // Passenger ft. Matt Corby You are so distracted by the pinkness of the sky that you don’t even bother to check your posture in the windows of the buildings you pass on your journey home. As you thumb the keychain in your pocket, you consider pulling out the car key instead of the house key. You wonder what the weather is like in New Orleans this time of year. You wonder how much rent costs in Brooklyn. You try to remember if your passport has expired or not. (10:17 pm) Refuse // Kevin Garrett The world is beautiful. You know this. But walking home in the darkness from an apartment you didn’t want to leave, you are suddenly and wholly overwhelmed by the number of people in the world you will never meet; the stories you will never make a cameo in; the hands you will never hold. You want to dissolve into the atmosphere so that maybe, five million years from now, you might have passed through every pair of lungs on earth. (11:40 pm) Death & Taxes // Daniel Caesar The day has wound down into itself like a board game packed perfectly away. You are drunk on tiredness and grateful for your body. You thank your feet for carrying you through the world, as big as it is. You look out the window to see Orion in the night sky; you admire his sharpness. Later, sinking into the ocean of your sheets, you cocoon yourself in a smug smile because your life might just be the most beautiful life anyone has ever lived. Your sprawl takes up the whole bed. (1:09 am) You Were Born — Live // Cloud Cult In the dream, you live inside a warm raincloud. You are a child (but a very wise and proud one; a king of sorts), and your heart is so big that people come from all over the universe to take pictures of it. Come back again soon, you tell them as they stumble out your door. A part of you wishes that just once, the visitors would stay — but maybe that’s just your heart talking. You are content and always feel full. Your cloudhome travels the earth, and you go with it, peering carefully down at the mountains and roads and valleys and rivers until you decide which place should be home. And then, when the time is right, you fall fat and heavy alongside your other water droplet brothers, weeping with the relief at the feeling of finally giving in to gravity. It is good. Find Playlist No. 4 on Spotify.